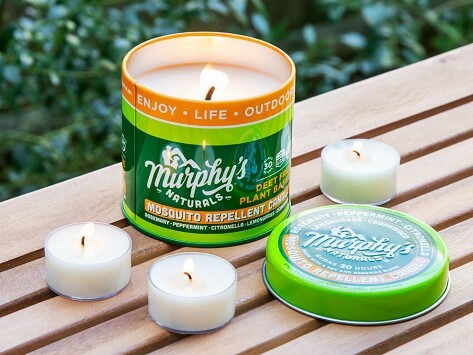 Ward off pests with natural mosquito repellent candles. High concentrations of citronella, cedarwood, rosemary, and other oils naturally combat mosquitoes and smell great, too. This formula doesn’t contain any DEET or petroleum, and the incense is clean-burning, so you can feel good about using it. Choose tea lights for a smaller, spread out glow or a 9 oz. jar candle for more repellent power. Burn time of four hours for tea lights and 30 hours for 9 oz. Dimensions: Tea lights: 1.5" x 1.5" x 0.5"; 9 oz. : 3.25" x 3.25" x 3"
Weight: Tea lights: 0.03 lb. ; 9 oz. : 0.74 lb.